1. In civil law, to adjudge or to condemn; to assign, to allot, or to deliver; to sell: After Tom's father died, two wills were found, but only one could be valid. Following the information given by the lawyers, the judge addicered the handwritten one in favor of the typed one left in the bank deposit box. 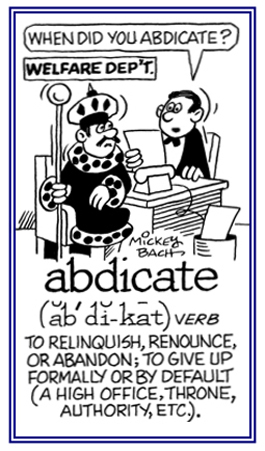 In Roman law, addico was one of the three words used to express the extent of civil jurisdiction of the praetors who were ancient Roman magistrates acting as the chiefs of law officers of the state. 2. To determine by a judge; to pass on and to decide judicially: Jane's friend was discovered selling drugs and in court the judge addicered him guilty of the crime. 1. A person who is overly engaged in his or her inclinations or desires to such a degree that it is impractical and can even be unhealthy: Susan loved her work so much and became so engaged in it that she became a real work addict, and did not have any extra time for her family or friends. 2. Someone who is obsessed by and devoted to the habitual and excessive use of a drug: Tim's friend was found to be a drug addict when his parents found cocaine hidden in his bedroom. Why is it that drug addicts and computer enthusiasts are both called "users"? Internet access has become a vital part of the modern world and an important tool in the education of children. Like addiction to drugs, alcohol, cigarettes, or caffeine, internet addicts are showing symptoms of increasing tolerance, withdrawal, mood changes, and interruption of social relationships. Children and adolescents who have become addicts of the internet often require increasing amounts of time online in order to feel satisfied. When they do not have access to the internet, they may have symptoms of withdrawal, which include anxiety, depression, irritability, trembling hands, restlessness, and obsessive thinking or fantasizing about the internet. Internet addiction is not limited just to introverted "computer-techies". The internet can provide a welcome escape for individuals who already suffer from a variety of psychological difficulties; including, anxiety, depression, and low self-esteem. Additionally, those who have struggled with other types of addiction may more easily become obsessed with the internet. Macedonian Radio Television, MPT on-line, February 13, 2007. 1. To cause someone, or oneself, to become overly dependent on something or a person: Joyce, who was evidently addicted to and overly dependent on television, liked watching TV so much that she totally broke down and cried when a storm caused a temporary loss of electrical power and she couldn't watch anything for over an hour. There is a significantly increasing number of people who are addicting themselves to foods that make them overly fat and unhealthy. 2. Etymology: from ad-, "to" + dicere, "to say, to declare". The study, management, and treatment of physical and mental excesses that harm people because they can not control their over dependence on them: There are more and more reasons for there to be specialists in various forms of addictionologies because there are increases in the various kinds of uncontrollable compulsions that are expanding among our current societies around the world. A reference to over dependence on doing something or that is very habit-forming: While studying medicine, Susan found out that being an addictive person doesn't necessarily have to relate to drugs but also to various kinds of activities; such as, having an endless desire to watch TV, or having an extreme passion for gambling, computer games, or even spending an excessive amount of time doing some kind of sport.